Windows Live, its not the same……..
For the last five years Windows Live has been my home on the Internet. Its where up until recently I tended to spend most of my time when online. I made loads of ‘friends’ on there. Spaces friends. It was so easy to make friends because it was one of the few sites where you had your own ‘webpage’ easily constructed just the way that you wanted it. Then you could, via your Home page, find other users Spaces and go and read what they had to say, then decide if you wished to be friends with them or not. Your home page contained an absolute brilliant search feature where you could search by Gender and age for example, thereby searching for like minded folks by using lots of useful criteria. You could share your photos via your Spaces page, show your favourite books, music, films and for any visitor to your Space, it was fairly straight forward to arrive at a decision as to whether they liked what they saw and then become your friend. Not only that but your home page also showed you a ‘running’ update of NEW users Spaces as well, so you could mosey over there and make friends with them if you liked what you saw. For me and countless others, there was no other blogging site quite like it for forming friendships and becoming a community. Then Wave 3 arrived. None of the changes made to the Windows Live site in Wave 3 had been asked for by the ‘bread and butter’ ordinary user. Not only that, but the whole site became a nightmare to navigate around. Users couldn’t find their friends. Why? Because now they were referred to as your Network and not Spaces friends as before. Users panicked. At that time I became very busy trying to help those on my Network who couldn’t find their way around because of the new changes. Many of my friends ended up leaving the site because they just couldn’t get used to any of the new changes, nor did they feel the changes enhanced the site or improved it. One of the biggest changes was the introduction of a feed on your home page called ‘What’s new with your Network’ and the inclusion into that feed of ‘Web Activities.’ The idea behind this was that when anyone in your Network did anything on another site such as Twitter, Digg or flickr for example, it would show in your ‘What’s new with your Network’ feed. Since the inception of this idea, many more sites have been added including Facebook. The big problem with this idea is that you can’t actually react to any of these updates apart from clicking on the update which just serves to take you from the Windows Live site to the external site. Over a period of time, this has had the increasing effect that Windows Live users have slowly drifted away to using these other sites instead of staying on Windows Live as they were doing before Wave 3. On your home page, you could be forgiven if you didn’t realise that on Windows Live you can create a webpage of your own called a Space. 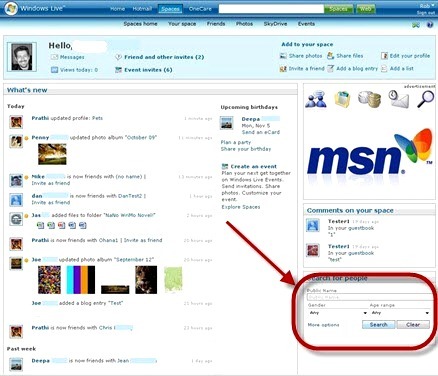 Despite the fact that previously this was the ‘hub’ of most peoples usage pre Wave 3, in Wave 3 it was ‘shunted’ to the depths of the More tab with the result that anyone new joining Windows Live will not even be aware of its existence. To add to this, where previously you could skip from blog to blog easily and also find new people with just one click, now its an absolute nightmare to go to another users Space never mind finding any new ones. Any updates made on the site itself such as someone posting to their blog or making a comment on someone else’s blog which used to take centre stage on your home page, now tends to get lost in a barrage of ‘Fred Bloggs said this on twitter’ or ‘ Sid Blank stated this on Facebook’ and as your home page only displays up to 20 updates by default, you miss most updates anyway, unless you were to sit there for hours glued to your home page! You can extend this to 50 updates from your Home page, but cannot make that the default number. Unlike on Facebook or twitter etc, the feed updates do not let you interact with them in any way. You can’t even ‘like’ or ‘unlike’ them and you certainly can’t comment on them. They are just feed updates and the only thing you can do is click on the URL if present or the update itself, and therefore whizz off somewhere else. Is this really the outcome that the Windows Live teams wanted to occur? I know that I wouldn’t want to encourage my users to go elsewhere if I had a site, I would want them to stay right there. 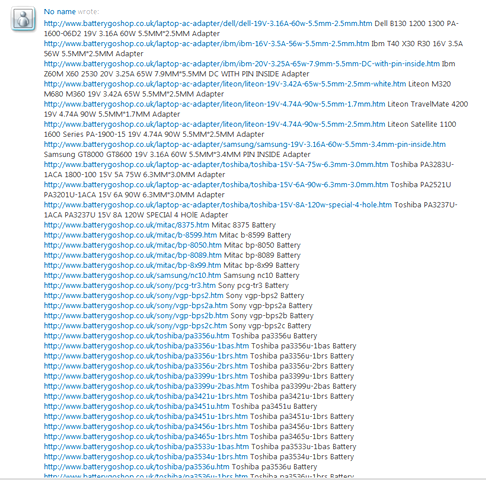 Then there’s the constant spam to contend with in the comments on your blogs. Windows Live doesn’t employ Captcha. Well, not for comments at any rate. It employs Captcha if you try to complain about said spam where you the innocent party in the whole affair, have to fill one in alongside a copy of the spam message you received and the URL of the perpetrator. Then repeat the whole thing again in a follow up email. If the Live teams want to see proof of the Spam perpetrators, they just have to go and look at the comments on their own Space! Its all very off-putting for users including me, and if I am getting fed up when I have been an avid Windows Live user and stalwart fan then it really isn’t looking terribly positive in my book. I know its not easy to get feedback from all of your users, especially when you are such a large corporation such as Microsoft. Its easier to ask those users who can make their voices heard such as the MVP’s, the Information Technology people and the professionals, but obviously there is a mismatch between what they think is an essential feature for the site and what the ‘ordinary everyday’ user actually needs. Meanwhile Windows Live is slowly bleeding its users elsewhere.